eBay This listing is for physical software not a download offer. Pictures are actual pictures. 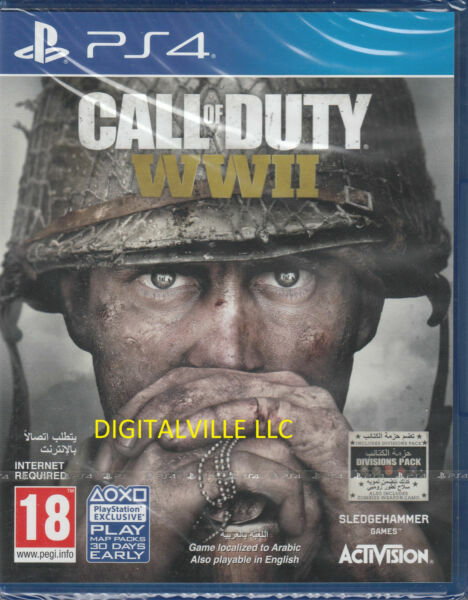 Thanks Digitalville LLC Product description Platform:Sony PlayStation 4 | Edition:Standard European English and Arabic Call of Duty returns to its roots with Call of Duty: WWII—a breathtaking experience that redefines World War II for a new gaming generation. Land in Normandy on D-Day and battle across Europe through iconic locations in history’s most monumental war. Experience classic Call of Duty combat, the bonds of camaraderie, and the unforgiving nature of war against a global power throwing the world into tyranny. Game Overview Call of Duty: WWII creates the definitive World War II next generation experience across three different game modes: Campaign, Multiplayer, and Co-Operative. Featuring stunning visuals, the Campaign transports players to the European theater as they engage in an all-new Call of Duty story set in iconic World War II battles. Multiplayer marks a return to original, boots-on-the ground Call of Duty gameplay. Authentic weapons and traditional run-and-gun action immerse you in a vast array of World War II–themed locations. The Co-Operative mode unleashes a new and original story in a standalone game experience full of unexpected, adrenaline-pumping moments. Game Details THE DEFINITIVE WORLD WAR II CAMPAIGN Call of Duty: WWII tells the story of the unbreakable brotherhood of common men fighting to preserve freedom in a world on the brink of tyranny. Players enlist in a gritty, intense journey through the battlegrounds of war. The Campaign features bold, lifelike visuals with the kind of blockbuster cinematic authenticity that only Call of Duty can deliver. BOOTS ON THE GROUND MULTIPLAYER Call of Duty: WWII Multiplayer engages players in grounded, fast-paced combat across many of World War II’s most iconic locations. Players will also enjoy exciting new ways to interact and socialize with their friends and the Call of Duty community. HIGH-OCTANE CO-OPERATIVE Call of Duty: WWII’s co-operative mode unleashes a new and original story. Play with your friends in this next-level standalone game experience full of unexpected, adrenaline-pumping moments.Please NOTE: This game is UK Import Game it is Region Free PAL Game. It is English and Arabic Version. Main Language is English.HD TV and HDMI Cable connection may be required to play. You may need to open free European PSN account for DLCs and extra contents and for online play for PS4 games. Internet connection is required. Content download is required. You must update the game before you can start playing. NBA 2K18 Nintendo Switch Game BRAND NEW FACTORY SEALED! SHIPS FAST!!! Playstation Vita Game Lot - 3 Games incl MLB 14, Mortal Kombat and Call of Duty!